Need a boost for getting your home practice off the ground? Are you a teacher looking for inspiration? 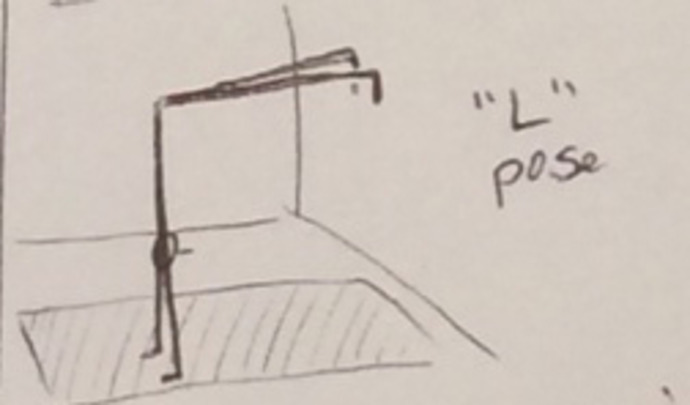 Do you just like drawings of stick figures? Look no further. Below is a sequence I’ve been working off of this week in classes. It started off as a Level 1-2 idea on twisting and using the wall to enhance the quality of our twists. However, as the week went on my class level advanced and attendance levels increased which limited our wall space. Low and behold, I had to modify. Those modifications are not shown here. I will note them later on. May this baseline sequence be the impetus to get on the mat at home and build off of to suit your desired direction. 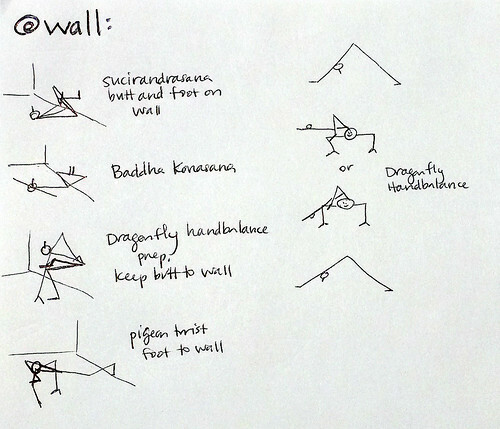 I broke up the twists at the wall with “L” poses a few times and ended with full handstand (adho mukha vrksasana). This way you could build the length in the spine symmetrically throughout in-case you miss building that in your twists. As classes shifted to strong level 2 and level 2-3, much of the wall sequence was omitted. I would have still liked to have had this be a part of class since so much can be gained from using the wall as a prop and preparing the body for a stronger sequence. But without the room to use the wall I had to take a different strategy. 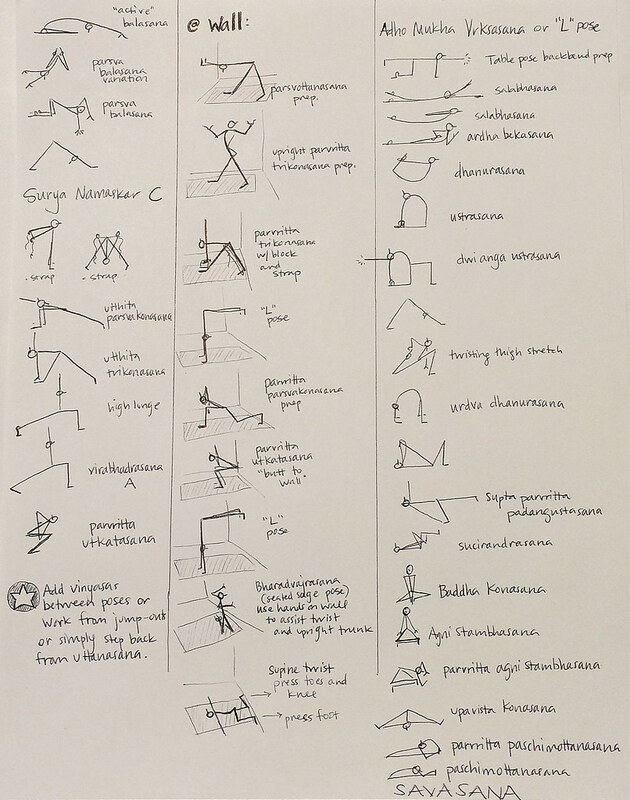 Due to the intensity of the hamstring opening required for the level 2-3 add-ons great emphasis was given to opening the backs of the legs in prasarita padottananasana and adho mukha svanasana prior. To successfully get more bang for your effort in twisting poses great emphasis on steadiness in foundation of the pose, lifting the side body out of the legs, twisting in the mid-upper back and using the shoulder blades pressing in to facilitate the movement are all needed. The binds (baddha) especially need the side body length to get the trunk far enough over so that when you wrap the upper arm around the thigh you don’t put weight into the pronating humerus. The drawings here are another direction that could be fun to take. We did not at all touch on this in class last week but thought it would be fun for you to see what else can happen when you use the wall as a prop. I would have put this in after all the other wall poses pictured above.